story of conflict and cooperation between a city and its citizens, a story that gives hope to the power of the public in preserving a piece of land to benefit the environment and a community. The original 1933 deed from the Way sisters reads that the land will fall, “under the name and title of Way Park.” To understand the purpose of this piece of land, we must look back to its origins. John S. Way, one of Northfield’s first settlers, purchased the large piece of land containing Way Park in 1882. The land was originally used as an open pasture where people participated in a variety of outdoor activities including sledding, ice-skating, and kite flying, long before it was designated an official park. During World War I, many homes were built on tracts surrounding the Way property, and the west side became a growing working class neighborhood. In 1933, Lucille and Laura, granddaughters of John S. Way, decided to offer the 4.6-acre tract between St. Olaf Avenue and Second Street to the city of Northfield. In the official donation deed the sisters made clear that the land was meant to be a public park named after their family. After the arrangement a local newspaper reported, “The new park is to be known as Way Park, thus establishing a memorial to a family which since pioneer days has been active in the up-building of the community.” Although the 1930s saw major construction to State and National Parks with help from the New Deal, the Great Depression stalled local development on Way Park. Some small accomplishments included the still-standing limestone wall and an ornamental pool. In 1938 the hospital board decided to build Northfield hospital on the south end of the Way property. Leal Headley, president of the board of Northfield Hospital, wrote for permission from the Way Sisters who responded positively. The hospital opened in 1939 with a quitclaim deed stating that any land no longer used for hospital purposes would be reverted back to park use. The north end was continually used for recreation. In the early 2000s the Northfield Hospital decided to relocate. By analyzing the second portion of the original Way deed which stated, “at all times be kept and maintained as a public park,” we can study the root of the greatest debate in the story of Way Park: should the land from the hospital be sold to private developers, or should it be maintained as public property for a park? On one side, the city argued that the quitclaim deed of the Way Sisters had expired after 30 years. They believed the land should be sold to build condominiums. On the other side, the public release of the Way Sisters’ original deed made the public aware of the original hopes for the land and they grew passionate for the cause to maintain the park. Many neighbors felt angry at the city for betraying the trust of the Way sisters and were excited by a greater outdoor space. In 2004 Way area neighbors held an informal gathering to reflect on what may happen with the property. One woman, Judy Swanson, stood up and suggested the formation of an organization to protect the historic parkland. Thus the Friends of Way Park was born. The FWP, a non-profit organization, was created with the mission, “to honor the Way family gift of 1933 by preserving this community parkland for present and future generations.” The group had a number of goals including cooperation with the city of Northfield to protect the park, encouraging community events, and raising funds to support their projects. The group started off strong in their campaign. Christopher Ennis received 500 signatures for a petition, wore a sandwich board, and created window placards that read “Save Way Park”. The placards could be seen all over Northfield. David Sudermann performed extensive research on the park and prepared a legal brief arguing for the land as Public Park. The underlying arguments supported by Sudermann and other FWP members were numerous. Park preservation would benefit the environment through cleaner air, increased bird habitats, and proper drainage. It would benefit the community by providing natural beauty, a community gathering location, and relief from noise. One of the strongest arguments was that this park would be a symbol for the civic pride of Northfield and have consistency in honoring the vision of its donors. 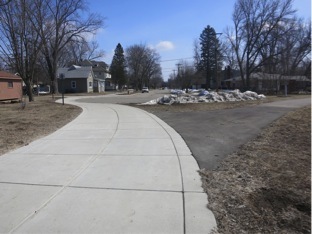 Trails connecting the north and south end of the park, representation of the unification after removal of the hospital, the closing of First Street, and the cooperation between city and FWP in building sidewalks to accommodate emergency vehicles. Feeling the incredible amount of public pressure and attempting to avoid a lawsuit, in 2004 the city decided to support the full restoration of Way Park, a huge success for the FWP and the citizens of the area. David Sudermann says, “When neighborhood citizens are committed and vocal, they can make big things happen.” The hospital was demolished in 2005. Spencer Jones, a landscape designer, developed a park plan. This new plan respected the original plans and the vision of the Way sisters, incorporating a hospital memorial, rain garden, and amphitheater. Controversially, the plan called for the closure of First Street down the middle of the park. This feature led to the second largest conflict in Way Park’s story. FWP supported the closing of First Street and built up neighborhood support. The organization wrote another essay to address the issue and to persuade the City Council to close First Street. The city hoped the neighborhood would be on their side, but most community and neighborhood members were in support of the FWP. They weren’t fazed by the small inconvenience and the closing would provide a safe space for children to play. A multitude of statistics were used to back up the necessity for neighborhood street safety. Additionally, the essay used phrases such as, “sense of place,” “small-town character,” and “connectivity” to argue for the unification of the park which would provide aesthetic, physical, and functional benefits. The City argued that the closing of First Street would delay emergency vehicles and worried that the culs-de-sac wouldn’t allow enough room for garbage trucks. To counter this, the FWP offered the compromise of constructing large sidewalks within the park that emergency vehicles could use if necessary and David Sudermann determined the necessary size of the culs-de-sac to be functional for the garbage trucks. Ultimately the First Street block was vacated and smaller culs-de-sacs were created to unify the park in 2009, the first step in realizing the master park plan. An asphalt trail was laid to connect the north and south end. Conflict is bound to arise in matters of public land. For many years, an antagonistic relationship existed between the city and the FWP that included arguments over allocation of money and implementation of rain gardens. After the hospital was demolished the FWP wanted to build sidewalks but needed to first do a topographical study of the land. They only had $50,000 to use, so the FWP decided to do the topographical study with the money and the City agreed to fund the connector trails. The success of the project proved the importance of a cooperative relationship. After internal reforms and the implementation of a liaison between the two organizations, the situation improved. The FWP now work closely with the Parks and Recreation Advisory Board (PRAB) with a current plan to complete the grading and add trees and benches. The PRAB has held two public open houses for input on design, acknowledging the importance of the public’s opinion and power. Looking towards the future, the FWP had to move from an oppositional group to a fundraising group. FWP is continually working to develop the park. Some money from the city can be used for the park, but a majority comes from fundraising. For example, a spaghetti dinner was held in 2009 followed by a benefit concert in May of 2012. The group meets weekly and posts notes on a public blog. The final part of the Way’s original deed reads, “of the City of Northfield”. Way Park is truly a gift for the city of Northfield, but it is also a product of the city and its citizens. The values and characteristics of Northfield are embedded in the entire process of maintaining Way Park. Northfield has historically been very civic-minded. Lucille Way herself had a history of community service. She directed a pageant at a Rice County Fair that depicted the advance of civilization with a finale representing community spirit prevailing over evils. Historically, the Northfield community citizens prevailed in a number of ways. They planned a sewage treatment plant, planted trees, and organized annual festivals. Carleton College designated 900 acres of land to be an arboretum for public use. In 2007, Northfield even created a comprehensive system plan including: parks, open spaces, and trails. Historically and today, parks hold strong value in society. Frederick Law Olmsted, America’s most famous landscape architect, set a trend of mixing human with natural. One facet of Olmsted’s work is an emphasis on democracy. “Olmsted saw parks as bastions of the democratic ideals of community and equality.” His city parks helped nurture the democratic spirit of a growing nation. Another advocate of parks in the United States was Theodore Roosevelt, a firm believer in a park’s ability to evoke democracy. His promotion of conservation revolved around democratic community and common land created by, “ordinary rural people.” Both of these characters of thought revolve around Turner’s original Frontier thesis stating that the nation’s frontier was a representation of individual democracy. When this frontier was gone he worried about what the nation would become. Parks, such as Way Park, have the ability to continue this “frontier” and embrace the nation’s value in unconquered land and the freedom and community that characterizes democracy. Way Park carries on the ideals of democracy. It is a public park that has been upheld and maintained by a democratic system that gives power to the public and the freedom to fight for something valuable. Not only do parks foster a democratic community, but they also raise respect for the earth and environmental causes within an urban setting. William Cronon, a professor of history and environmental studies, speaks to this saying, “Idealizing a distant wilderness too often means not idealizing the environment in which we actually live.” Olmsted believed, “The park should, as far as possible, complement the town…what we want to gain is tranquility and rest to the mind.” The combination of nature with a community of people results in a simpler life close to nature and an increased sense of self. The past of Way Park can act as a tool for the future. The FWP have developed techniques that can guide them through the future projects of the park. David Sudermann believes that there is still work to be done in realizing the full potential of the park plan developed by Spencer Jones, and the FWP need to stay vigilant. There is continued work being done to deal with the land on which the current EMS station lies on the edge of the park. The FWP continue to fight for the land to be used as a parking lot opposed to being sold. Sudermann is also working diligently to receive official designation of the park as a heritage preservation site, which would increase the opportunities for grants and prevent the city from using any part of the land for non-park purposes. However, the Park Board does not support this request, as they believe historic recognition constitutes buildings, not landscape. As is apparent, the fight to protect parks and all that they represent to the community persists, but so does the power of the grassroots movements and the average citizen in making change. David Sudermann, “”Past as Prologue”: A brief history of Way Park” (Essay, Northfield, MN, 2006), 4. Maia Rodriguez, “The History of Northfield’s Way Park (Part One),” Northfield.org, May 14, 2010, http://northfield.org/node/8124. Maia Rodriguez, “More on the History of Way Park,” Northfield.org, May 14, 2010, http://northfield.org/node/8180. The Northfield Independent, January 4, 1934, quoted in David Sudermann, “Way Park and the 1939 Northfield Hospital: Historical and Legal Aspects of the Case for Dedication,” (Legal Brief, Northfield, MN, 2004), 6. David Sudermann, “Way Park and the 1939 Northfield Hospital: Historical and Legal Aspects of the Case for Dedication,” (Legal Brief, Northfield, MN, 2004), 8. David Sudermann, “Way Park and the 1939 Northfield Hospital: Historical and Legal Aspects of the Case for Dedication,” (Legal Brief, Northfield, MN, 2004), 10. Matt Rohn, interview by author, Northfield, MN, May 3, 2013. Friends of Way Park, “Way Park,” Friends of Way Park (blog), http://waypark.wordpress.com/about/. David Sudermann, “Way Park and the 1939 Northfield Hospital: Historical and Legal Aspects of the Case for Dedication,” (Legal Brief, Northfield, MN, 2004). David Sudermann, interview by author, Northfield, MN, May 7, 2013. Maia Rodriguez, “The Future of Way Park,” Northfield.org, May 14, 2010, http://northfield.org/node/8181. David Sudermann, “A Future for Way Park,” (Essay, Northfield, MN, 2009), 5. “Way Park Continues its Transformation,” The City Commons, September 2011, 1. “Way Park: A Park for All Seasons”, Friends of Way Park (blog), http://waypark.blogspot.com/p/master-plan.html. David Sudermann, “”Past as Prologue”: A brief history of Way Park,” (Essay, Northfield, MN, 2006), 3. Northfield Heritage Preservation Commission, Northfield: The History and Architecture of a Community (Northfield, MN: Northfield Heritage Preservation Commission. 1999), 14. “Frederick Law Olmsted,” National Park Service, Accessed May 17, 2013. http://www.nps.gov/frla/historyculture/index.htm. Ted Steinberg, Down to Earth: Nature’s Role in American History (New York, NY: Oxford University Press, 2013), 137. “Frederick Jackson Turner,” New Perspectives on the West, 2001. http://www.pbs.org/weta/thewest/people/s_z/turner.htm. William Cronon, “The Trouble With Wilderness: Or, Getting Back to the Wrong Nature,” Environmental History 1, no. 1 (1996): 16. William Cronon, Nature’s Metropolis: Chicago and the Great West (New York, NY: Norton &Company, 1991), 380. Friends of Way Park. “Application to Designate Way Park a Heritage Preservation Site.” (Essay, Northfield, MN, 2008) 1. David Sudermann, “Way Park and the 1939 Northfield Hospital: Historical and Legal Aspects of the Case for Dedication,” (Legal Brief, Northfield, MN, 2004), 3. Sarah Carlsen to Mark Henke, May 25, 2012, http://bloximages.newyork1.vip.townnews.com/southernminn.com/content/tncms/assets/v3/editorial/8/74/87431a80-eebb-5c1a-9c40-8458e20fb807/4ff1bea047eae.pdf.pdf. Carlsen, Sarah. Sarah Carlsen to Mark Henke. May 25, 2012. http://bloximages.newyork1.vip.townnews.com/southernminn.com/content/tncms/assets/v3/editorial/8/74/87431a80-eebb-5c1a-9c40-8458e20fb807/4ff1bea047eae.pdf.pdf. Cronon, William. Nature’s Metropolis: Chicago and the Great West. New York, NY: Norton &Company, 1991. Cronon, William. “The Trouble With Wilderness: Or, Getting Back to the Wrong Nature.” Environmental History 1, no. 1 (1996): 7-28. “Frederick Jackson Turner.” New Perspectives on the West. 2001. http://www.pbs.org/weta/thewest/people/s_z/turner.htm. “Frederick Law Olmsted.” National Park Service. Accessed May 17, 2013. http://www.nps.gov/frla/historyculture/index.htm. Friends of Way Park. “Application to Designate Way Park a Heritage Preservation Site.” Essay, Northfield, MN, 2008. Friends of Way Park. “Way Park.” Friends of Way Park. http://waypark.wordpress.com/about/. Friends of Way Park. “Way Park: A Park for All Seasons.” Friends of Way Park. http://waypark.blogspot.com/p/master-plan.html. Northfield Heritage Preservation Commission. Northfield: The History and Architecture of a Community. Northfield, MN: Northfield Heritage Preservation Commission. 1999. Northfield Hospital & Clinics. 2013. “History.” Northfield Hospital & Clinics. http://www.northfieldhospital.org/about/history/. Rodriguez, Maia. “The Future of Way Park, and the Recent City Council Decision.” Northfield.org, May 24, 2010. http://northfield.org/node/8181. Rodriguez, Maia. “The History of Northfield’s Way Park (Part One).” Northfield.org. May 14, 2010. http://northfield.org/node/8124. Rodriguez, Maia. “More on the History of Way Park.” Northfield.org, May 24, 2010. http://northfield.org/node/8180. Sudermann, David. “A Future for Way Park.” Essay, Northfield, MN, 2009. https://docs.google.com/a/stolaf.edu/file/d/0B-HfGCFxXCyZOTkxM2E1NjUtYTg2OC00NWUzLThmMzktOWMzMjdiZjhmYmMx/edit?hl=en&authkey=CNTGutMC. Sudermann, David. “”Past as Prologue”: A brief history of Way Park.” Essay, Northfield, MN, 2006. https://docs.google.com/a/stolaf.edu/file/d/0B-HfGCFxXCyZY2YyNzdjNmEtOTVmNy00MGUwLWIzMTYtNmVhYTRiNjJmNDYw/edit?hl=en&authkey=CJnAsJAP. Sudermann, David. “Way Park and the 1939 Northfield Hospital: Historical and Legal Aspects of the Case for Dedication.” Legal Brief, Northfield, MN, 2004. “Way Park Continues its Transformation.” The City Commons, 14, no. 5 (September 2011): 1.